The Ethnography and Evaluation Research group at the University of Colorado, Boulder, was commissioned to study inquiry-based learning at the four university IBL centers. These are the centers started in 2004 and supported by EAF (see Centers). There have been many assessments of the effectiveness of IBL at various educational levels and subjects. 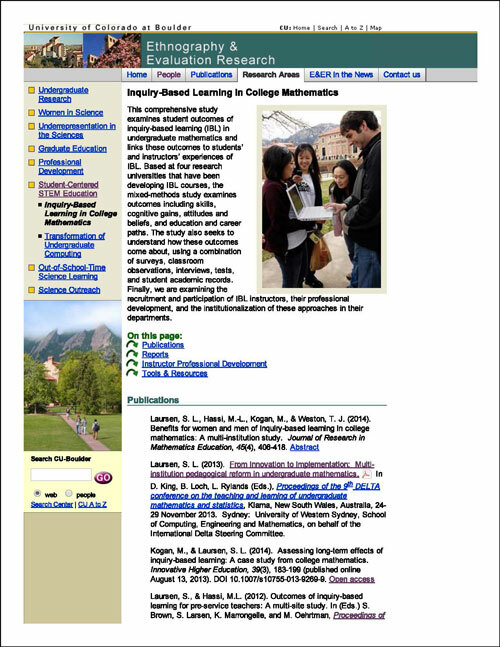 This is the first large-scale study devoted to mathematics at the undergraduate level. Data was gathered from more than 100 course sections over two academic years at the four campuses. The project involved analyzing results of classroom observation, surveys, student transcripts, student and teacher interviews, and tests. The full report and related documents are available at the Colorado site.